Source: the Globe, February 10, 1932. 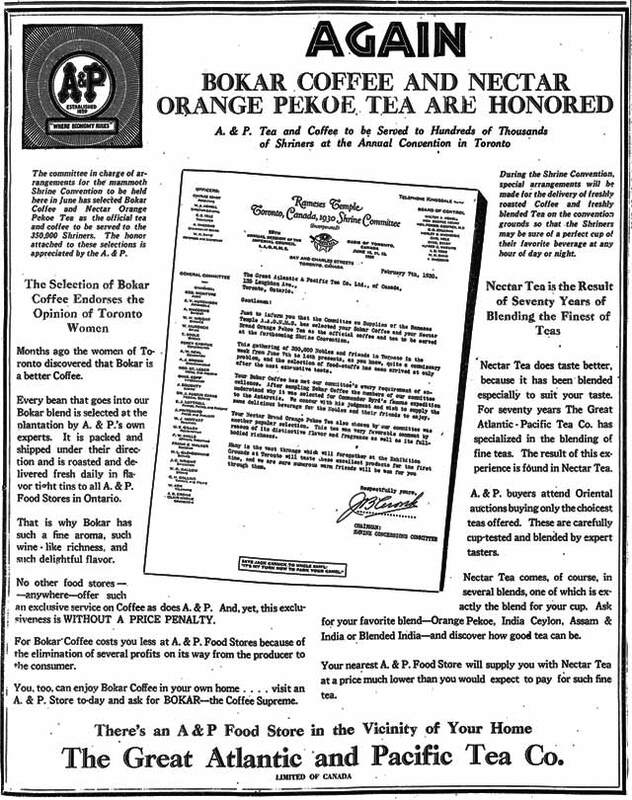 At its peak, the Great Atlantic & Pacific Tea Company was the largest retailer on the planet. By the end of the 1920s, the grocer boasted up to 16,000 stores across the United States, Ontario, and Quebec. As late as the early 1960s, A&P could boast about its dominant size. But over half a century of decline may have culminated this week when the 156-year-old grocer filed for Chapter 11 bankruptcy for the second time in five years, leaving 296 stores up for grabs. Contemplate those numbers the next time you ponder the size of today’s retail giants. These stores are a combination of groceries and meats, and are pretty well standardized although they are not always exactly the same. They are attractively laid out with meats down one side, groceries opposite, and usually a big display refrigerator at the rear. One of the fundamental principles of the company is to display as many goods as possible in each of their stores. They also make a point of price-ticketing everything so that the customer does not have to ask the price of any line on view. Dotted here and there along the floor and in front of counters are several wire display stands each containing one particular line of goods and usually at a special price. The meat display counter is refrigerated by pipes that are cooled by machinery in the basement. The counter is glass-topped. While the meats on display cannot be touched from the outside, the salesman back of the counter has ready access to them and can easily pick out any cut desired. Source: Toronto Star, March 13, 1930. Many locations were placed near existing Dominion stores. Several press accounts noted how Dominion’s owners had previously worked for A&P, a factor which may have heightened the grocers’ rivalry. The company invested $175,000 to build a combination bakery/head office/warehouse complex at the northeast corner of Laughton Avenue and Connolly Street in the city’s west end. Opened in December 1929, the facility’s perks included banana-ripening rooms and a laundry for store uniforms. “One is at once impressed with the spaciousness, wide and sunny offices, and the ordered cleanliness of the storage rooms,” the Globe observed. 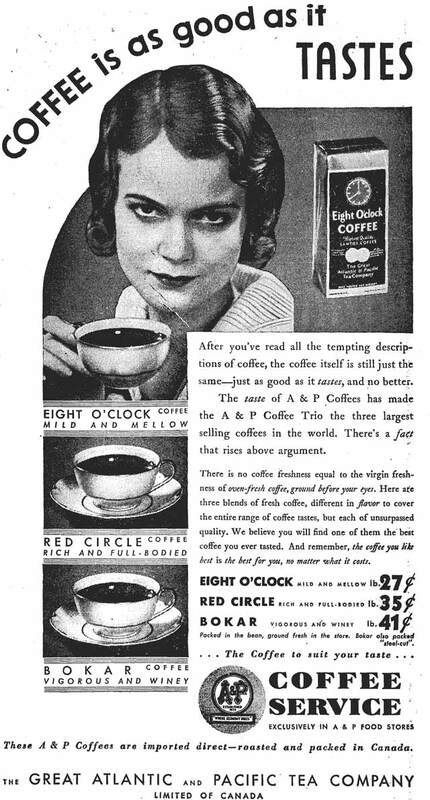 The following decade saw a few hiccups that caused executives to down more than a few cups of Eight O’Clock Coffee. In 1933, city councillor Sam McBride charged A&P with providing inferior goods to customers using relief vouchers issued during the depths of the Great Depression. While denying McBride’s charges, an A&P official admitted they wash imported carrots. 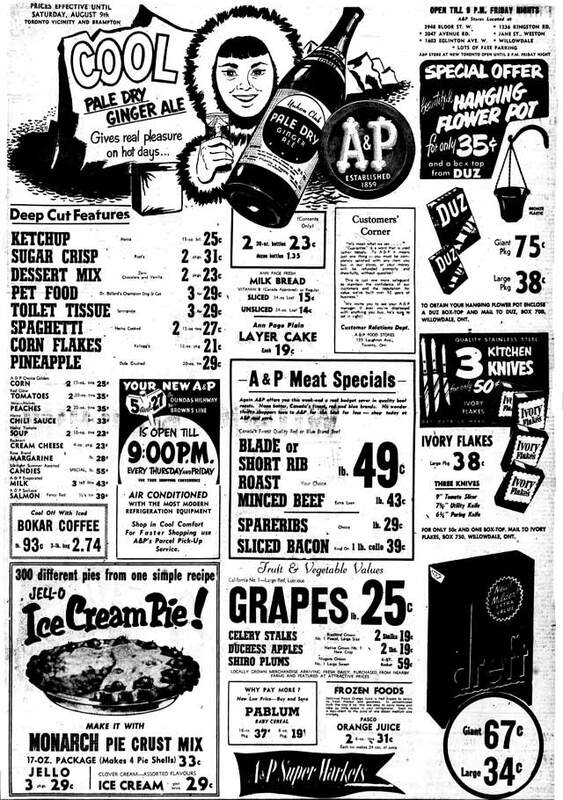 Alongside competitors like Loblaws and Simpsons, A&P was charged in 1935 with short-weighing goods. Source: the Globe and Mail, July 29, 1966. By the mid-1960s, A&P’s American operations were declining. An aging board of directors failed to adjust to a changing marketplace, especially the emergence of suburbia. Small, crummy stores reeked of fatigue and wilting produce. Instead of re-investing its profits, management heeded calls to increase already generous dividends. Yet the picture in Canada appeared rosier: its program of store modernization was a model for the rest of the chain. 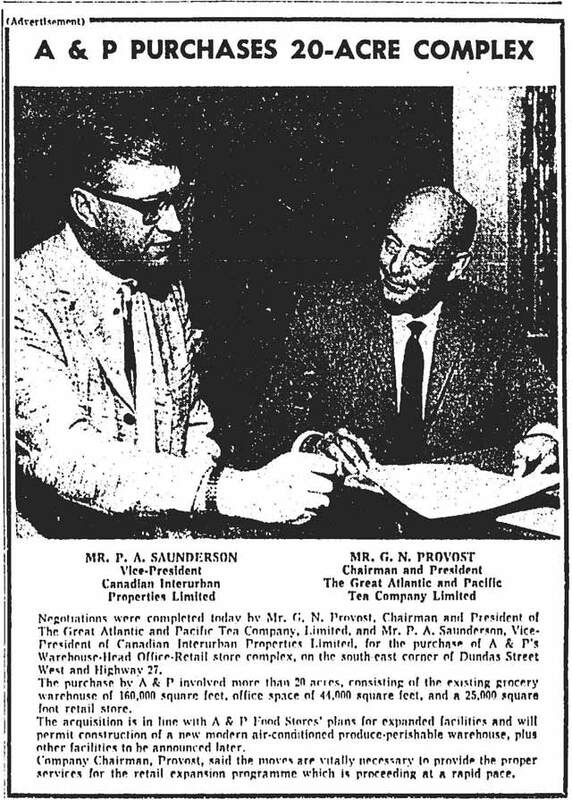 In 1966, 20 acres of land on Dundas Street east of Highway 27 (now Highway 427) in Etobicoke were purchased for a new head office/warehouse/store complex, a facility still used by Metro today. To build local customer loyalty, A&P undertook promotions such as distributing flyers in English and Italian to west-end neighbourhoods. While American operations contracted following A&P’s purchase by Germany’s Tengelmann Group in 1979, the Canadian division benefitted from the demise of two major rivals. When Conrad Black’s Argus Corporation broke up Dominion in 1985, A&P picked up its Ontario stores, retaining the brand for its GTA locations. Five years later, Miracle Food Mart was acquired from the remnants of Steinberg’s, though that banner was phased out following a lengthy strike in the mid-1990s. Source: the Telegram, August 7, 1952. The Dundas/Browns Line location mentioned in this ad was A&P’s largest Canadian store to date. Perks included a 300-space parking lot, and aisles wide enough to accommodate 500 shoppers in the store at a time. As the 1990s ended, A&P Canada was the company’s only profitable division. This provoked rumours of a sell-off to infuse funds into the flailing American operations. Suitor speculations ranged from Sobeys to Walmart. Quebec-based Metro won out in July 2005, and within five years rebranded all remaining banners apart from Food Basics. Additional material from The Great A&P and the Struggle for Small Business in America by Marc Levinson (New York: Hill and Wang, 2011); the September 28, 1928 and July-August 1998 editions of Canadian Grocer; the December 10, 1929, May 24, 1933, and March 27, 1935 editions of the Globe; and the July 17, 1952 and August 17, 1965 edition of the Globe and Mail.